This post is harder to write than I expected. I was at my desk and about to write Rica a letter when I learnt that she had died. It was not unanticipated. She was 97 and had been in frail health for a while. I had only just completed another, perhaps final, re-edit of my 1966-1967 memoir When I was Bad which tells how I met Rica and how she rescued me. Rica Hodgson is one of the leading South African freedom fighters celebrated by South African History Online (SAHO). 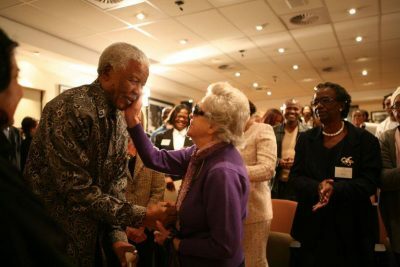 On this amazing site, you can read her biography and those of many other significant figures in the anti-apartheid movement. Rica is also someone to whom I owe an immense debt. When I first knew Rica she worked in the Welfare Department at Defence and Aid in London channelling aid to apartheid prisoners and their families. I wasn’t part of that remit but she helped me anyway. Without her I might have lost my child and ended up on the streets seriously depressed and suicidal. In April 1966, I was alone, poor and pregnant. Rica became my friend. She was at my wedding in 1969, I visited her when I could, went to her 80th birthday party in London, stayed with her in Joburg, went with her to the ANC offices where I met her boss Walter Sisulu, met her in Lusaka, Zambia, and talked of her experiences at Solomon Mahlunga Freedom College in Tanzania. Rica Hodgson and Nelson Mandela. Everything to do with the anti-apartheid struggle and the African National Congress and with Rica’s work was dangerous until Nelson Mandela was elected President of South Africa. The apartheid government assassinated Ruth First, Chris Hani and many others. They attempted to kill Albie Sachs too. For 30 years it was essential to keep silent so as not to endanger the freedom movement. 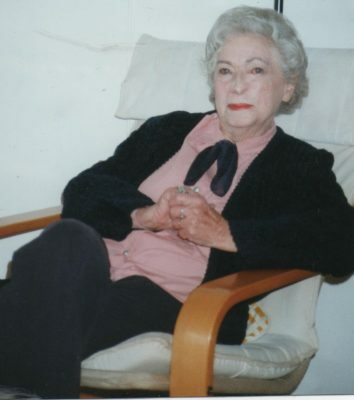 Rica in her Berea flat in Joburg shortly before moving to Pretoria in 2000. This was the last time I saw her. Rica was responsible for the first publication of one of my poems in Sechaba, the ANC magazine. She was a stern critic and told me that my first novel, The Love and Wisdom Crimes, should not be a fictionalised version of my life but an accurate account of value to the anti-apartheid archives. Her memoir Foot Soldier for Freedom is indicative of her courage and her modesty about her own life. I sent her drafts of my memoir a while ago and I know that she did see some of it. I hope, at last, that it met with her approval. It will be dedicated to Rica. In honour of Rica I am posting a part of my memoir about my first encounter with her on this post. It is longer than normal and I hope you don’t mind that. The entire memoir will be published sometime this year.
. . . The woman who answered my phone-call gave me an instant brush-off.
. . . Now I was stuffed, as well as pregnant.
. . . I knew Max’s wife was about to put down the handset and once it was down she wouldn’t pick it up again. I had no fall-back plan, no idea what to do next. I had only seconds.
. . . Max’s wife must have known I was utterly desperate. Perhaps she decided it would be tidier to pass me on rather than hear the phone ring again and think of me in tears while she refused to answer. There was the briefest hesitation. I had a pen and paper. For the life of me I can’t remember where they came from or how I had them. I hadn’t yet grasped the life skill that warns you that for every border crossing, literacy and its tools are mandatory. I wrote down ‘Defence and Aid’, ‘Rica Hodgson’, and the office phone number. What was Defence and Aid? Who was Rica Hodgson?
. . . I put the receiver back after Max Joffe’s wife hung up, sorted out some more change, then dialled the Defence and Aid number and asked for Rica. My hands were trembling but not, this time, because I was cold. I suppose I was tearful. I am sure my terror must have been obvious. Rica’s familiar-sounding South African accent calmed me. 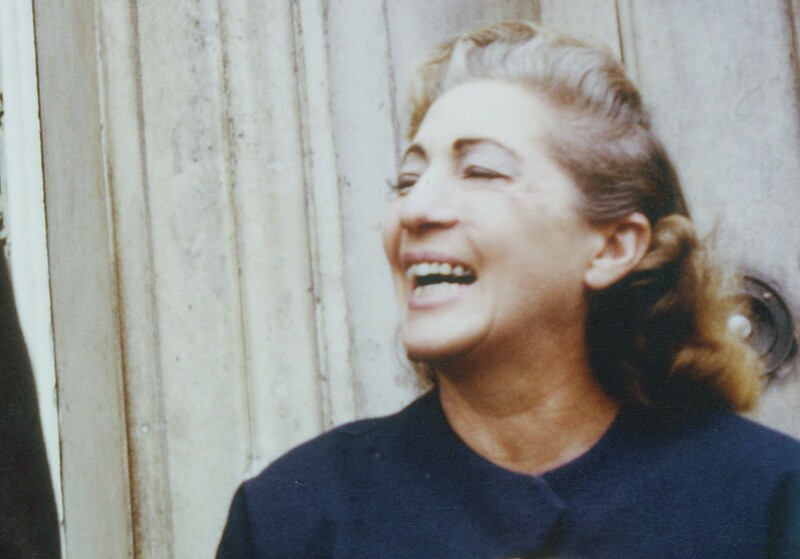 Her voice had life and energy and a lift that indicated a sense of humour. She sounded sensible and straightforward. She wasted no time and few words but gave me back some purpose and hope. Rica gave me her office address. It meant nothing to me. I had no map of London in my head and had never seen one anyway. In any case London was the wrong way up on an upside-down world. We all instinctively navigate by the sun and the sun was now low on the southern side of the hemisphere while the west was on my right and the east on my left instead of the other way around. I would go in circles for a while whenever that turncoat orb put in its infrequent appearances on the other side of the planet. “Do you have much luggage? Is it heavy? Can you carry it up the stairs to the office?” Rica asked. She told me what the taxi would cost. “You are only minutes away,” she said. In those days it was easier to get around London by car and cab than it is today. My vague plan had been to stay with Max Joffe for a few days until I found a room to rent and a job that I could do as an unmarried woman with a baby. Bill had said I could go on National Assistance as Social Security was called then, but I didn’t really know what that was either. I had saved what money I could for rent and food but that was as far as I had got with my plans. Rica, I hoped, would help me find somewhere to stay till I got myself sorted. That was all. I didn’t know that Defence and Aid helped refugees and I did not think of myself as a refugee. Young as I was, I was an educated white woman who had had a life of privilege in Southern Africa.
. . . My taxi was soon outside the Defence and Aid office. I paid the cab-driver, hauled out my suitcase, rang the bell and climbed up the stairs. Rica was short, slim, neatly dressed, bright-eyed, very efficient and she smoked all the time. She welcomed me with a smile and a quick perceptive glance, sat me down, asked me questions, made some unvoiced judgements and a few phone-calls, then told me what I already knew, that I was most in need of some sleep. She fixed that almost immediately. She must have seen and helped many people in much worse situations than mine and she knew exactly who to call on and what to arrange. For my part I knew nothing about her or her history or her work. I accepted what Rica was doing without asking questions. She set off at a smart pace with me following unsteadily behind. We came to my first London Underground station. In 1966 it was not clean and bright with shiny metals, plastics and tiles as it is now. Neither was it crowded with commuters. The escalator had wooden treads; the train had a slatted wooden floor. There was only one carriage on each train that was for non-smokers and it was always empty. Rica went into a smoking carriage. I had no idea of directions or even of time.
. . . Rica must have told me that I was at the St. Paul’s Cathedral Deanery in the home of Canon Collins and his wife, but I had no real appreciation of where I was. I remembered that I had heard of Defence and Aid and of Canon Collins back home. They were hated in South Africa and Rhodesia by the governments and the right-wing press because of their support and help for black exiles, political dissidents and their families. I never expected my path would cross with theirs or with people like Rica Hodgson and her husband, Jack, who were fighting apartheid. They were people who did dangerous, important things that I would not have had the courage to do. I hadn’t even been brave enough to stand up in my classroom at school and read aloud in front of my peer group. I didn’t think of my situation as similar to that of a freedom fighter. Mine was a domestic and personal problem. It might have been caused by South Africa’s racial laws about miscegenation but it was my fault that I became pregnant. Instead of contributing to the fight for justice I had been ignorant of the ‘facts of life’. Wonderful story want to read more. Thank you Carol – I hope to publish the whole memoir this year and I hope that you will want to read it all. Merci Ruth pour ce témoignage émouvant. Merci Brigitte pour votre commentaire sur mon post – Je suis très heureux que vous ayez pris le temps de le lire. Thank you for this. I’m Jack and Rica’s great granddaughter. 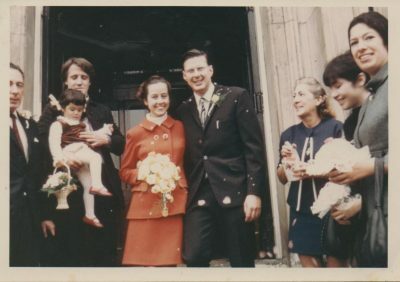 Would it be ok to keep a copy of your wedding photo? As you are Rica’s family, of course, you may have this photo of Rica with my best wishes. I may be able to find another – not good quality because of the time ago that it was taken but still perhaps, worth having.